Polaris began in an "introduction to astronomy" course, when we were assigned to go stargazing. Generally in the United States, the easiest constellations to find are Orion and the Big Dipper. With the Big Dipper, you can easily find Polaris, which points north. 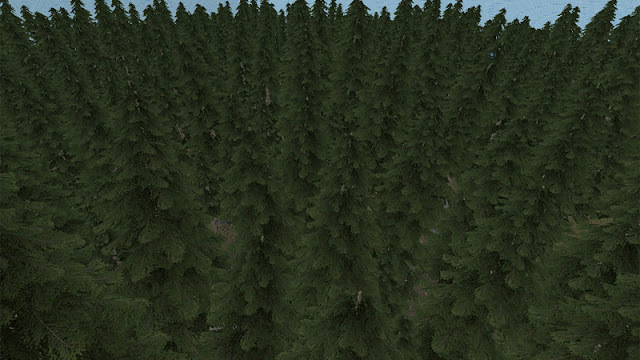 My first instinct was to create a giant forest and see if the player can navigate a foreign landscape using Polaris. So that's what I prototyped. ... It didn't really work out. It wasn't really that fun, fumbling around in a dark forest. Plus, once you find Polaris, you walk in a straight line and then that's it. I mean, I guess it could've been interesting if you had to find landmarks and change directions and if I had hunters and striders after you, but then it would just be another Source mod with a gimmick. The "act of stargazing" has to be the central mechanic, not merely an orienteering device. 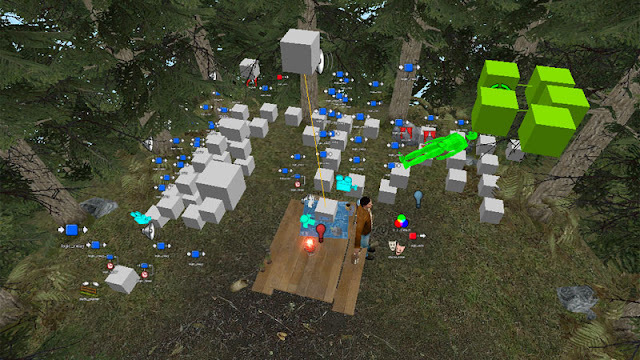 Besides, consider Valve's research on "teaching" with Half-Life 2 -- that scene when you're first practicing with the gravity gun in the scrapyard -- and they concluded that "learning" is most effective when you don't have any pressure to go quickly and when there's no danger. The mood has to be peaceful, and staring up at the sky for extended periods ends up leaving you pretty vulnerable to flechette rounds shot into your back. So a giant sprawling forest sounds great and all, but much like multiplayer Portal deathmatch it doesn't really make much sense. I set to work, going in the opposite direction -- starting with a small box. And that's what kind of worked. 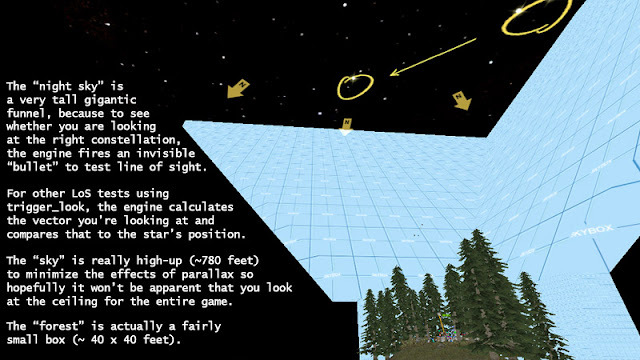 So that's how the engine sees the "forest" in Polaris: you're standing at the bottom of a funnel, staring at the ceiling for minutes on end. The engine probably thinks you're stupid for doing that. But it's worth it, because a lot of players seemed to like the idea of a skybox being interactive: so often in games, the skybox is some impossibly distant backdrop outside of your control. But here, it's YOU who highlights the constellations and it's YOU who makes the stars spin. Some playtesters didn't like how they were limited to an FPS-axis of looking -- one suggested the crosshair turn into a freehand cursor -- but I guess this is one instance where you have to filter feedback, because I felt that the limitation is important. I'm trying to draw attention to how "looking" works in an FPS game, and a game like this makes the constraints somewhat clear. Tuning the difficulty was probably the biggest challenge, so I created a compromise of sorts: the "panic" button that points out the star for you, as well as a timer that gradually dims the background "noise" stars so you notice the target stars more clearly. It is my belief that games don't have to be difficult. They must merely "feel" difficult. Besides -- if it's single player, most players will only play through the entire thing once, if at all. 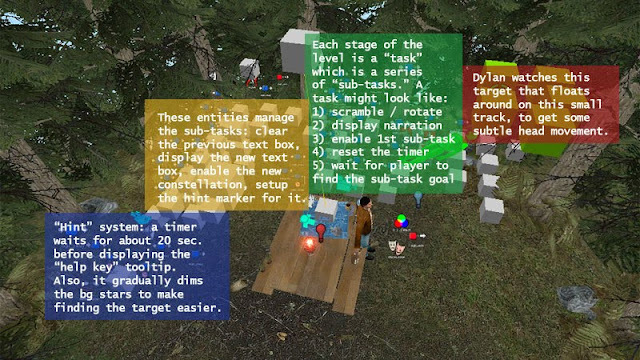 Why not script everything, if the player doesn't notice? It's not "cheating" because we're not the player's opponent -- we are the creators, the moderators. Much like NPC AI, the goal isn't to beat the player; it's to put up a fight and then yield gracefully. That's what's interesting about constellations: apparent arrangements of stars, tracing shapes in the night sky. It exists only because we're looking at it. In reality, the stars are light years upon light years apart. They only exist because we look at them like this, at this point in space. Constellations are about... perspective. And so is the narrative in Polaris. Next up -- Liner Notes: Polaris and its narrative.